Following the brutal murders of 2,974 human beings on 11 Sept 2001, critical physical evidence at the World Trade Center crime scene was purposely removed and destroyed. Disinformation programs were implemented on 11 September and continue to this day. 1. Make the wheels of government turn by organizing your local community to demand that the 9/11 murderers be brought to justice. How to organize? Go to www.coworker.org for help organizing your group. Then, go to the Albert Einstein Instiution website, and download Dr. Gene Sharp's handbook, From Dictatorship to Democracy (free in PDF in the Online Library) and his other books. They will serve you as outstanding references. 2. Hold conferences in your hometown to present and discuss the Forensic Evidence of the 9/11 murders. 3. Work to Reverse Citizen's United vs. Federal Election Commission. 4. Work to repeal three, Bill of Rights busting laws: (a) the USA PATRIOT Act (Yes, Congress “repealed” the Patriot Act. But it was in name only. Now we must work to revise the Freedom Act.) (b) the Military Commission Act and (c) section 1021 of the National Defense Authorization Act of 2012. 5. Establish a “Constitution Protection Zone” in your city or town. 6. Work to re-establish the Glass-Steagall Act. 7. Work to retrieve the trillions of dollars now being expended through the "Deep Black Ops Budget" and put it to use serving the needs of the people by creating decent paying employment and returning the billions of dollars stolen from the 99.9% during Depression.2. 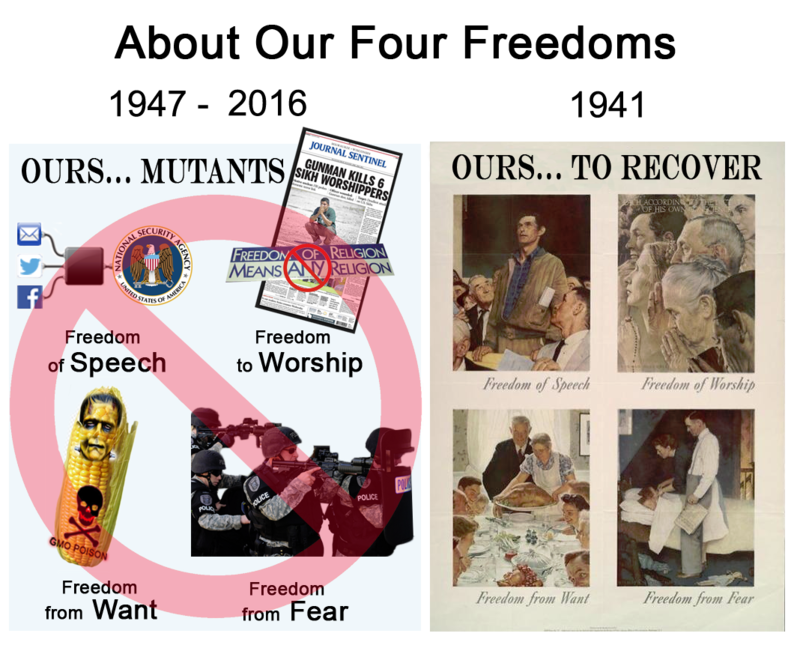 Since 1947 we have passively stood by allowing our Four Freedoms to metastasize into cancerous, Fascist tools. But this year, 2015, is the year we began the process of restoring them back to vigorous, life-affirming health.